My Whole10 plus intermittent fasting (otherwise known as skipping breakfast) finished last night although I am expecting my weight to continue to drop for probably another 48 hours. Let’s see. My reflections are that mainly that I didn’t notice much difference overall. I slept a bit better and woke up more easily in the morning. I was hungry by the time my evening meal came around and most evenings I ate earlier than my usual 8pm by up to an hour. My fasted work outs were not an issue with sprint patterns, LISS, resistance and flexibility all feeling slightly better and more enjoyable. My machine chest press is back to a 5 rep max of 105kg so I don’t think I have lost muscle. My weight was 12 stone 8lbs(176lbs, 80kg) this morning down from 13 stone (182lbs, 82.7kg) ten days ago. That compares well to my usual non-intermittent fasted Whole30 I do in January in a third of the time. Also I went down a notch on my belt, which is about an inch and my clothes are noticeably looser, particularly my trousers. In terms of food, breakfast was coffee, black and fairly strong. 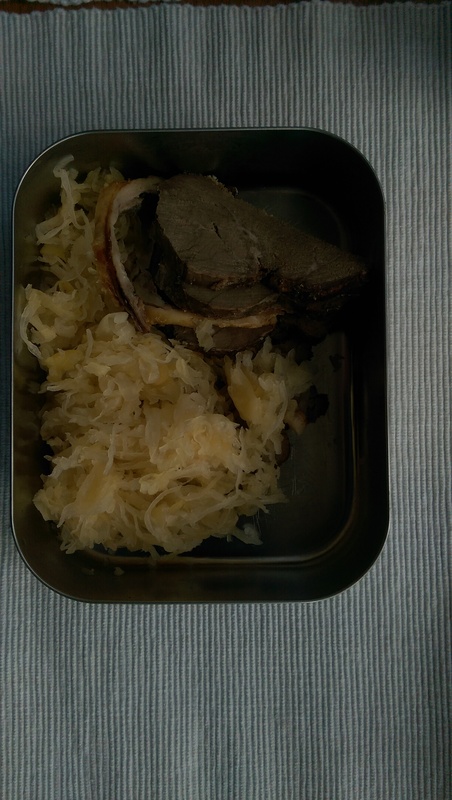 Lunch was 100g of protein if some sort (usually leftovers) and 100g of sauerkraut. Dinner was simply a Whole30 compliant meal. 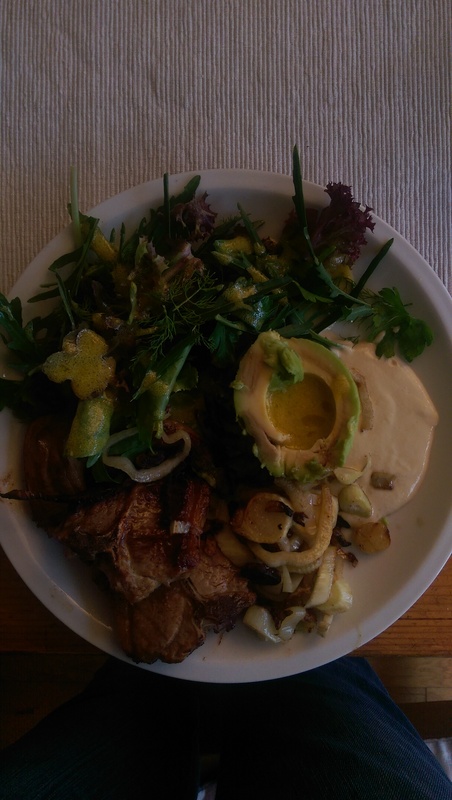 Last night was lamb chops, avocado and salad. Overall, pretty successful and not overly challenging. However a word of warning… I DO NOT suggest doing this unless you are already fat/keto adapted. You need to rapidly raise your fat burning to accommodate the IF and fasted work outs and if your body is not able to do that it will just go into “starvation mode”. The Whole 10 experiment continues with everything in my life remaining as it was and just the diet changing. I am four days in now and had a great work out yesterday. I was pleased to discover yesterday that after a few weeks of a strange pain free “injury” which lost me 30kg off my machine chest press, almost entirely on my right side, I am back to within 5kg of my 5 rep max of 105kg which indicates to me that my body is still building muscle rather than tearing it down for gluconeogenesis. 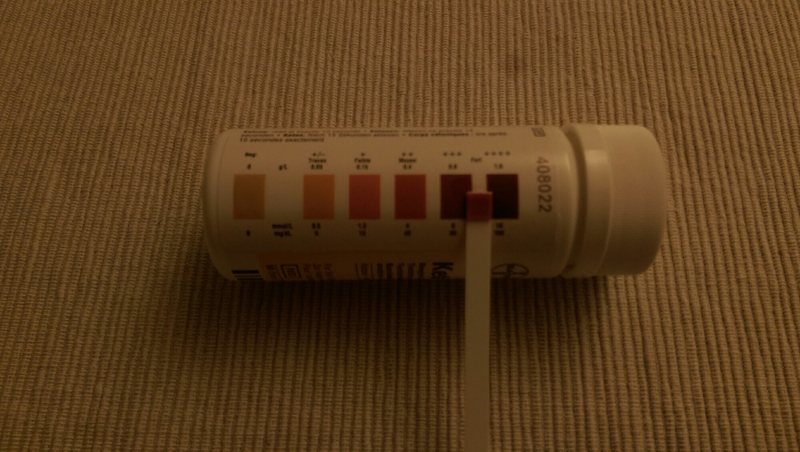 Ketosis is fully established now as shown by my ketostix. I am not eating a huge amount of fat. After 4 days my weight is 4lbs down on the start of the 10 and 5lbs down on where it was a week ago today. I sincerely doubt it will continue at a pound a day and most of the 4lbs is probably water but we will see. 6 days to go. Carbohydrates and Health – the SACN report. The Scientific Advisory Committee on Nutrition’s report on Carbohydrates and Health was published last Friday. I will have a look and see if there is anything more interesting to report. Anyway my n=1 experiment with a Whole 10 continues. I have been in fairly strong ketosis for the 48 hours that I have been “Whole10-ing” with no obvious effects except I am hot (as in temperature!) but that could be the weather. 1lb off in 48 hours. The first day of a Whole 10 over and apart from sleeping like a log (no alcohol last night?) and being a pound lighter (probably caused by dehydration after leading two back to back HIIT classes at the gym last night) I don’t feel any different from usual. Along with the Whole 10 auto-immune exclusion diet I am also intermittently fasting between my evening meal and lunch. I hope to strip out some fat from some stubborn areas. We will see how things develop. I don’t expect to get “hangry” as I don’t often feel hungry and I think I have pretty good blood glucose control by now but here is an interesting article from the Independent this morning on the mechanism that appears to associate hunger with anger of relative severities. Something of which I think diabetic people are well aware. So, just for the record, starting weight was almost exactly 13 stone (182lbs, 82.7kg) which is a few pounds heavier than usual for me. We will see what is achievable in 10 days. If you are not sure what the Whole 10 (or 30) is, follow the Dallas and Melissa Hartwig link at the side. From its beginnings, the sugar industry has always been political. The production of sugar initially was only possible because of its heavy reliance on the slave trade and the aggressive colonisation of warmer countries. The use of indentured labour, which is about as close to slavery as you can get without it actually being slavery, was common and huge numbers of people were shipped around the world to service the labour intensive industry. The sugar industry tried to demonstrate that it had a social conscience by funding things that would be seen as good for people (in this country, not the slave labour) such as art galleries. Fast forward to the last century and we can see how the sugar industry used its money to fund the scientific research community. The same research community that silenced John Yudkin when he tried to publicise the link he found between sugar consumption and heart disease. This morning, I watched a report on tooth decay in children and how it is almost out of control in the UK where total extractions of all baby teeth due to decay are now common. I find that shocking and more so because everyone knows it is simply caused by sugar and can be prevented by reducing sugar consumption but we still don’t help our children to save their teeth. Then today I read in the paper that the UK government has delayed Public Health England’s report on sugar consumption and health. Strange that… I wonder why it’s a good idea to delay a report that may help people lead healthier lives, maybe lose weight, maybe not get heart disease. It must be something really important that would delay such an vital report? … it’s about whipping cream and why it goes stiff and other stuff. By the way, you could always use the saved buttermilk from your homemade butter to start a sauerkraut culture. Why was I whipping cream? Because berries are in season and I eat berries that are in season. Does my weight go up with the extra sugar load? Yes it does. 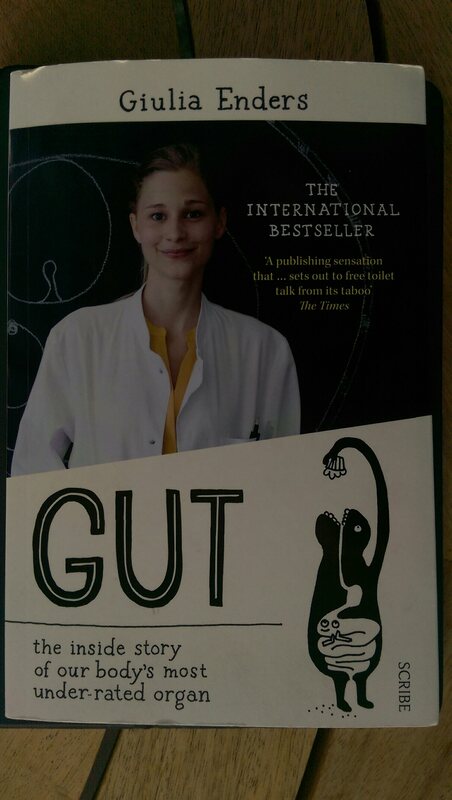 In a previous post I mentioned that I was going to read Giulia Enders’s book Gut. I have finished it now and I thoroughly recommend it. It’s written in an accessible style and is a fascinating journey from mouth to bum and tells you all you need to know to keep a healthy and happy gut and do efficient poos. In an earlier post I mentioned Michael Gershon’s book, The Second Brain, and was pleased to see he got a name check in Giulia Enders’s book in the section that discussed serotonin as the nerotransmitter of the gut brain – the second human brain. That’s the same serotonin that a lack of in the head brain causes depression.